Seaweed health benefits are primarily attributed to the abundance of minerals and trace elements in ocean water. These nutrients make seaweed particularly valuable in our diets and is the main reason for its increasing popularity. Ounce for ounce, sea vegetables are up to 20 times higher in essential nutrients than land vegetables. In addition, the unique dietary fiber of seaweed has been linked to the reduction of blood clots and cancer prevention. For optimum nutrition, edible seaweeds should be used in small amounts in soups, cooked with vegetables or beans, or prepared as a side dish. The 5 most popular seaweeds include wakame, kombu, nori, dulse and kelp. Wakame is a good source of vitamins A, C, and E and provides omega-3 fatty acids that help reduce cholesterol, lower blood pressure, promote weight loss and fight cancer. Wakame is often used in soups and fresh seaweed salads. Kombu is a rich source of fucoidan, a polysaccharide that kills specific cancer cells and improves immune system function. Similar to other brown seaweeds, it is rich in calcium, magnesium, folate, protein, and fiber. The thick pieces of kelp are often used to flavor soup stocks. Nori is a form of red algae that contains calcium, zinc, and iron, as well as vitamins A and C. Its iodine content supports healthy thyroid function. Nori is often sold in thin, dried sheets and can be eaten as a snack or used for wrapping rice or sushi. Since nori is high in sodium, people with high blood pressure should not eat it. ﻿Dulse is another form of red algae that is high in fiber, protein, vitamins B6, B12, and iron and potassium. Look for it as a dried seasoning or in chips, dietary supplements, or flavor cubes. Kelp is a type of brown algae that can grow to enormous sizes far out in the depths of the ocean. It is a good source of folic acid and other B-vitamins. It is also contains many trace minerals, especially iodine.Small amounts of kelp in your daily diet will go a long way in ensuring healthy thyroid function. In order to maximize seaweed health benefits, the sea vegetables should be soaked in enough warm water to cover them for 10 to 20 minutes or until they are soft enough to slice. 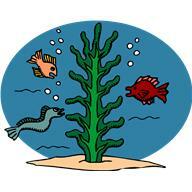 Always discard the water used to soak seaweed because it will have high sodium content. Seaweeds can be purchased at most health food stores or groceries that stock specialties for Asian cooking. Ann Wigmore; The Hippocrates Diet and Health Progra; 1983. HealthyEating.SFgate.com: What Are the Health Benefits of Eating Seaweed?